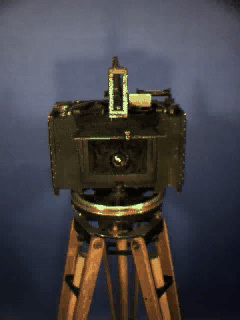 The camera was designed in 1930 by W. B. Osborne. Leupold-Volpel Co., Portland, OR built as many as 10 of them. Each was custom- built and calibrated, creating noninterchangable components, requiring that each camera and supporting equipment be kept together as a unit and not mixed with the others. 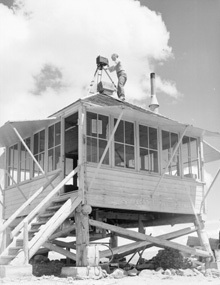 One of the cameras in use, in the 1930's or 1940's, on Soda Mtn in Southern Oregon. Copyright© 1998 IamWho Panoramic Imaging. Taken during the VR'ing of the camera.